This product has been discountinued. So you want your Arduino to surf the web but you don't have room for the Arduino board plus the Ethernet Shield. What do you do? 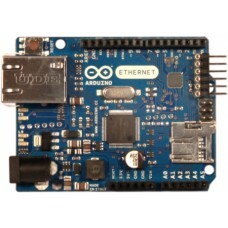 How about giving the Arduino Ethernet a try? 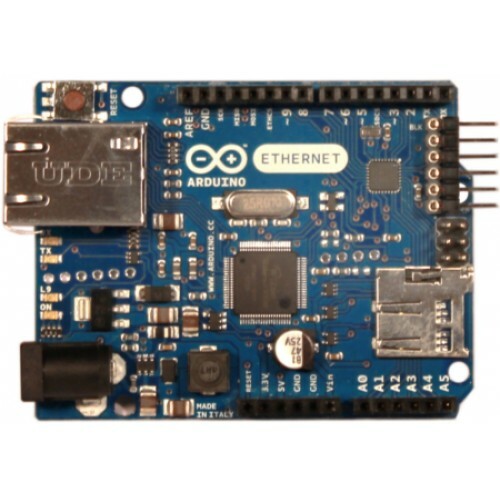 The Arduino Ethernet is an Arduino development board with the Wiznet Ethernet interface built in on the same board! It has 14 digital input/output pins, 6 analog inputs, a 16 MHz crystal oscillator, a RJ45connection, a power jack, an ICSP header, and a reset button. Arduino is an open-source physical computing platform based on a simple i/o board and a development environment that implements the Processing/Wiringlanguage. Arduino can be used to develop stand-alone interactive objects or can be connected to software on your computer (e.g. Flash, Processing, MaxMSP). The open-source IDE can be downloaded for free (currently for Mac OS X, Windows, and Linux).